When building a deck, you need more than a single product – you need a complete waterproofing deck system. Duradek provides permanent waterproof protection better than any of the alternatives. 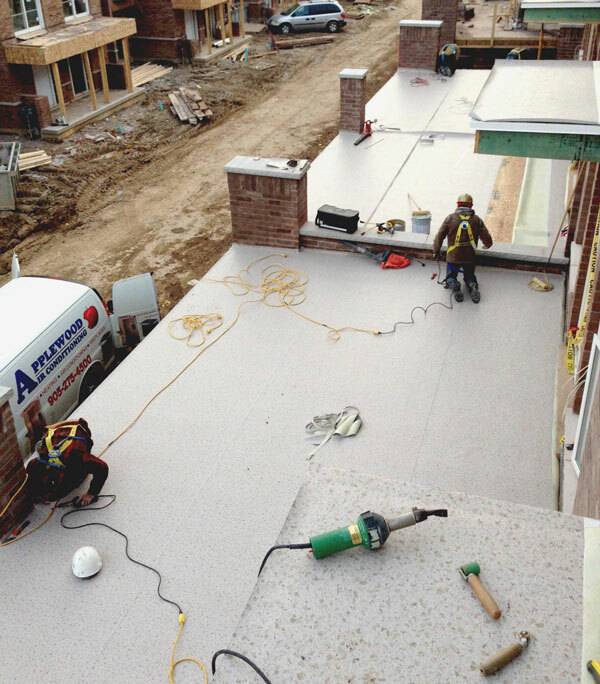 Our roof-grade waterproof protection has the advantages of a dry-below system and a pedestrian deck surface in a single product application. Alternative methods require 2 or 3 products to achieve the same results. All necessary components of the finished waterproof system are available from Duradek, including adhesives, sealants, drains, scuppers and perimeter fastening devices. Duradek’s adhesives are formulated specifically for best use with Duradek vinyl membranes. Various grades and seasonal formulas are available to provide the best performance for individual project and temperature considerations. Duradek conducts ongoing quality testing on all of our adhesives for field performance to ensure permanent adhesion and product compatibility with all elements of the complete waterproof decking system. Perimeter trims and caulking serve a critical function in the overall waterproof integrity of your project. Our available color selection perfectly complements our vinyl colors so your project gets the finished look you desire. There’s no stopping the rain, but there are ways to successfully manage it. Our range of water routing products ensure that whether you have an elevated deck, a roof deck or an enclosed deck, water will be managed so it flows away from the building envelope. Your Waterproofing Deck System with all the components you need from Duradek. All of the necessary tools and components needed to install our sheet vinyl are available from Duradek. This one-stop-shop makes it easy for our dealers to conveniently access everything they need for an installation so they have the most time available to be on project sites. All Duradek products when applied by an authorized Duradek contractor are covered by written warranties. For reliable protection for your home, Duradek is your one-stop-shop for a completely waterproof deck system including railings.